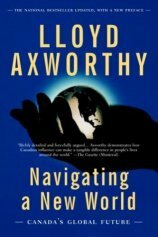 Axworthy is a former federal Canadian cabinet minister, Nobel prize nominee and now is head of the University of Winnipeg. He called for an international criminal court, brokered a ban on landmines and drew international attention to the plight of war-affected children. He talks about Canada’s international future creating a just world. Axworthy really gave Condoleezza Rice a piece of Canada’s mind in an open letter in the Winnipeg Free Press .